In Reinfeld where I am right now, there are quite a lot of little birds. I shot several photos of small ones, but sometimes it’s incredible hard to determine the birds. Take the photo in this post for example, it was a challenge to find the name, and I am not even sure about it yet. There are three very similar birds, the siskin, the serin and the yellowhammer buntin, all of them have some very similar features and colors. 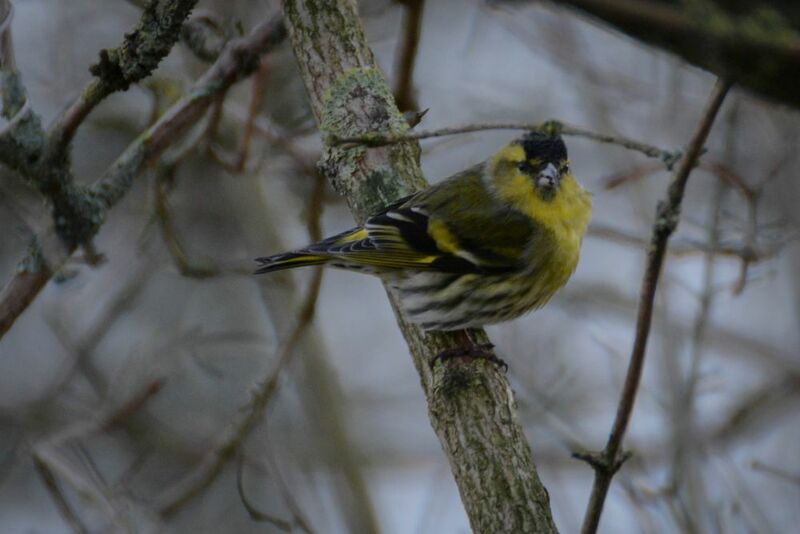 I think the bird in my photo might be a siskin, I say that because after researching I found out that the males have a very prominent black stripe on the head. Maybe I shouldn’t make a science out of it, maybe I should just take the photos, but when you take photos, you are also often interested to learn more about your subjects, that is curiosity. We have several gray, black and yellow birds here too and I am never sure which variety they are. It is hard to tell when there are so many similar species. The one you captured here is sure cute, whatever it is! Dennis I think that I already told you before to get in touch withe Cornell Lab of Ornithology, they can help to identify ANY bird. Wonderful website with webcams videos of wild birds even. They research and protect birds. Try it: http://www.birds.cornell.edu – Cornell Lab of Ornithology – Cornell University, Ithaca NY. yr. bird photos are good. I’m a birder … and we ALL have trouble with the little yellow warblers. There are a slew of them. They are all about the same size, the same general patterns, and similar colors which sometimes overlap. There’s a section in my bird book titled “Similar looking little yellow birds” into which category these birds fit. Yep, that counts for many little birds… I have some more new photos and I didn’t upload them yet because I still wanted to research the bird name. The new ones are as little bit not yellow, rather a mix of brown and grey…. it’s funny, I find a lot of them here, they all vary so much that even researching is very difficult. Often I nail it down to four or more species, but then it’s a lot of guessing. It can be quite difficult… If I am really curious, I have some official nature sites from the government where I could ask.